If you've ever stepped into your bathtub for a relaxing bath and met tiny worm-like creatures, you likely want to know how to get them out and why they were in your tub in the first place. These worms are actually not worms at all but the larvae of the moth fly. Also known as the drain fly, the moth fly commonly frequents areas in which moisture is present, such as tubs and sinks. The insect's larvae typically look like worms and are legless, gray and usually about 3/8 inch long. Fortunately, getting rid of the moth fly and its offspring is fairly simple. Most folks prefer their tubs worm-free. Scrub the area around your bath drain. Moth fly larvae tend to feed off the gelatinous material that often forms around drains. Use drain cleaner and a sponge or scrub brush to clean the area. Clean the drain at least once a week to keep the area germ- and larvae-free. If you have a septic system, use safe septic cleaners. Set a trap over the drain. Cover the underside of a plastic margarine container lid with a thin coat of petroleum jelly and place it on top of the drain. The emerging flies and larvae will likely become trapped inside the sticky substance. Leave the cleaned trap on the drain until collection has ceased. 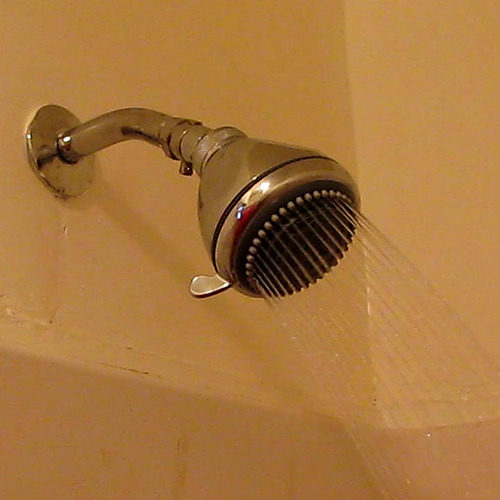 Clean the pipes that lead up to your shower drain with a long-handled, stiff brush. Cleaning the pipes can eliminate the gelatinous grime in which the larvae feed and cut off their food supply, which will cause them to perish. Apply an aerosol insecticide to the larvae that is safe to use indoors. The insecticide will kill the larvae, but they will continue to return unless you remove their food source. Most insecticides go directly on the larvae; however, read the directions on your particular product for best results.